In college, I majored in history and was required to take a class on methodology. 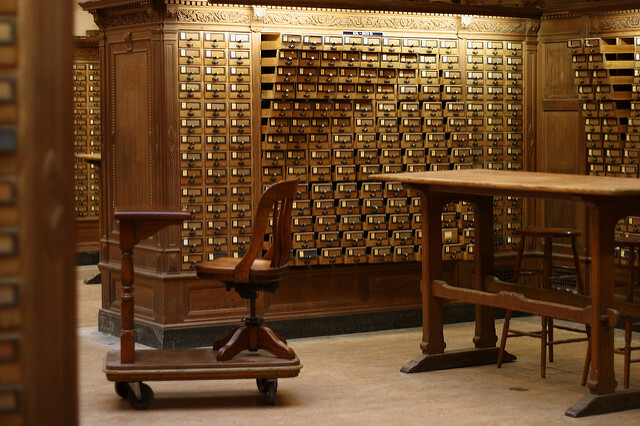 Holding our blank index cards, our class walked to the university’s library, met with the reference librarian, and then were set free to browse… the card catalog drawers. We were there to learn about historical evidence – primary and secondary sources. Primary sources are best described as direct, first-hand accounts. They are factual and not interpretive. Secondary sources are one step removed. Although they often quote or use primary sources, the information might include analysis or interpretations. My parents will be relieved to know I still apply my Liberal Arts education in my work. For example, when I started in prospect research there weren’t a lot of online options. If I needed basic information about a property or a company, I called the assessor’s office or the Secretary of State’s office. That was in 1998 and in 2018 I still do that, but without the awkward phone call. By going directly to a government source to find the value of a home or the status of a company, I’m using a primary resource. Our field has several sophisticated fee-based products available to consider. I always start with one of these to use as my jumping off point. The vendor pulls information from several primary and secondary sources and aggregates the data into one place. Within seconds of entering a name, I start to develop a picture of who I’m researching. These products are helpful resources to use, but they still need a living, breathing researcher to verify that this is ‘my’ Robert, Bob, Rob Smith Jr. or Sr. and complete the overall picture. What are primary resources in our world of research? To find a primary source you get to use your research skills. Real Estate – For most counties, the assessor’s office will have the most up to date market or assessed value and sales information. Try searching both the name and the mailing address and you might find your prospect owns other properties. Foundations – Always use the 990-PF (and their website if you’re lucky). There are several free sites providing the past three years’ filings. Fee-based resources will offer more. You might be tempted by the charts and tables, but bypass and go directly to the 990 filings. The summarized information often misses grants and might not include the most recent year. Public Companies and Stockholdings – Find the SEC filing. Public companies should have investor relations information on their website. There are other free resources where you can find a company’s annual report and related filings. Don’t forget your local library and their online databases. The easiest resource for insider information and company reports is the SEC’s EDGAR. This isn’t something I would have said a few years ago, but I’ve come to appreciate EDGAR and its straightforward simplicity. For insider holdings, search an individual under the search field for a company by entering Last Name First Name (don’t use a comma). Licensed Professionals – By going to a state’s licensing board verification website you might get lucky and find additional information about your accountant, physician, investment advisor, attorney or any other profession requiring a license. Whether their license is currently active or not, some states provide education, employment dates, employment history, awards or honors, and sometimes a red flag you need to further research. Corporations – Go to your Secretary of State’s business or corporate look-up website. Most can provide basic information about a corporation’s status and the registered agent’s name and address (sometimes the owner and their business address). Some states will let you search by an individual’s name to find their affiliated entities. If I find a property held in the name of an LLC, my next search is to see if I can make a connection to my prospect. Don’t forget to search the holding company’s name in the ICIJ’s Offshore Leaks Database for red flags. Giving – Do a simple search using variations of your prospect and his/her partner’s names. Although the paid resources come close, you’ll still find an overlooked annual report or two, and it might not be listed as “unspecified amount.” You will also find more recent and possibly larger gifts announced through an organization’s publications, press releases, and articles. Although you may find the majority of your profile through free websites, a primary source for information is not always going to be publicly available. Access and the types of information available to us is rapidly changing with privacy concerns, social media, GDPR, data leaks, and more. If you can’t find a primary source for your research, your next step is a secondary source, including another vendor product if you have one, to compare results and enhance your profile. This extra minute of due diligence might save you from an embarrassing and discrediting situation or it can make you the hero because you found that overlooked $20 million NYC co-op held under the dba Research Hero LLC.